Africa’s Fashion showpiece THE Glitz AFRICA FASHION WEEK returns for the 2nd time with even more panache – 50 runway shows, insightful seminars, exhibitions, parties happening with over 70 international models, top Pan-African designers, fashionistas who will showcase hundreds creative fashion trends. There will be Musical performance from Jon Germaine, Okyeame Kwame, Gina West, and many others. 10th November 2013 – runway designers pop up shops – Alisa hotel. The Glitz Africa Fashion Week is presented by GLITZ AFRICA MAGAZINE and proudly sponsor by Samsung, Amarula, Vlisco, Alisa Hotel, Oak plaza hotel, Blacksecret make up and MVP. Log on www.glitzafricafashionweek.com. 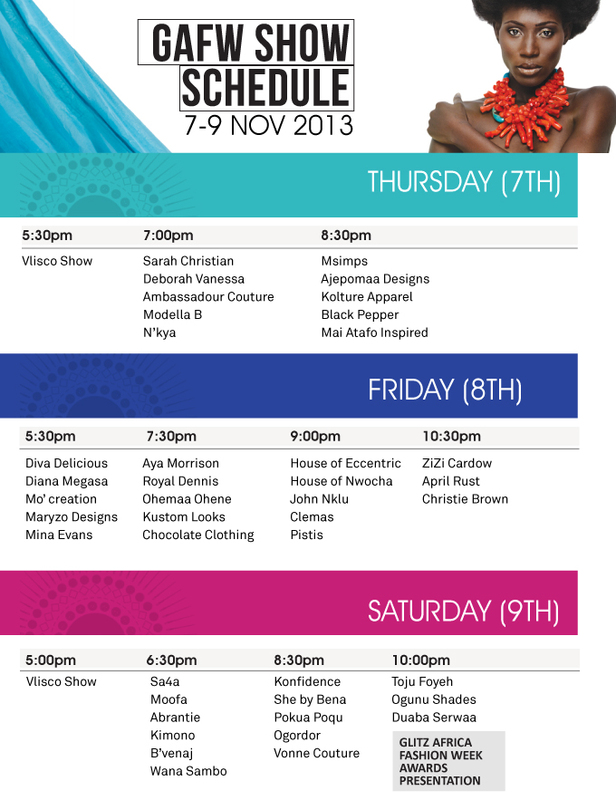 Glitz Africa Fashion Week announces event schedule 0 out of 5 based on 0 ratings. 0 user reviews.